After the summer concerts McArthurGlen Designer Outlet continues with new concerts. This time in collaboration with MAD TV, on the 20th of September at 8 p.m. McArthurGlen proudly presents Melisses and Kostas Martakis. McArthurGlen village welcomes autumn with a unique concert and invites you to spend an unforgettable, MAD night with beloved artists. So save the date for Friday, the 20th of September at 8 p.m., the village will be filled again with music and dancing at the New Season Concert! 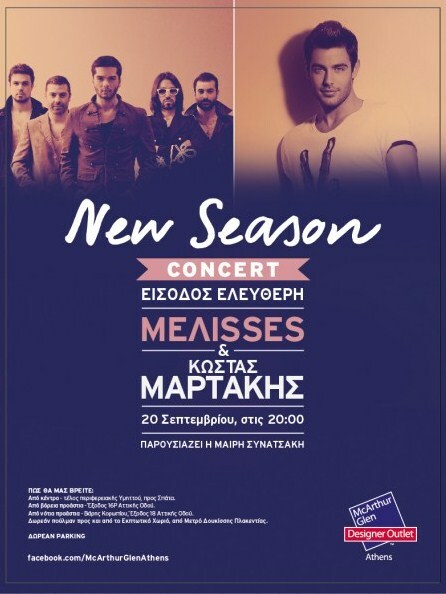 Melisses will mark the start of the autumn season singing on stage at McArthurGlen with their well known hits, and then the mood will elevate Kostas Martakis with his favorite songs. The concert is organized by MAD and will be presented by Mary Sinatsaki , which will give its own cheerful tone of the night! Combine shopping and entertainment and enter the draw to win € 500 in gift certificates. The lucky winner will be announced by Mary Sinatsaki the same night.